Uglyworld #277 - Save The Pizza, Save The World, originally uploaded by www.bazpics.com. Finally I have a happy Wage and Babo here once again (complete with their pizza which was ordered 3 HOURS AGO!!!). WAGE: "Where's Joey, I'm going to do him some damage!" Server: "Entschuldigung, ich kann ein bissien Englische sprechen"
WAGE: "I don't care, when I shout, you listen, capiche?" BABO: "You heard him, listen!!!" WAGE: "I ordered a pizza at 8.15pm tonight and you don't deliver it yet!!!" BABO: "Yeah, 8.15 pee emm's, that's long ago!!!" 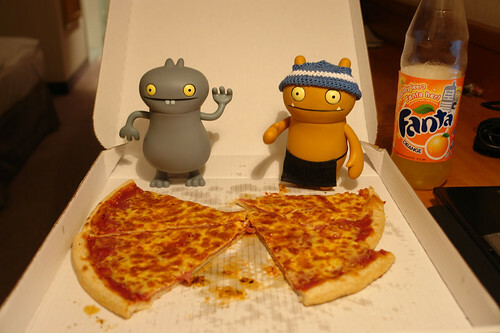 WAGE: "No, unless it means I get my pizza"
BABO: "Just tell her, she smiled at you"
WAGE: "My name's Wage - and I'm fuelled with Rage!!!" Wage then grabbed the pizza and walked for the door, the server shouted at him that he had to pay for it. While she was doing this Babo grabbed a bottle of Fanta from the fridge and sneaked past her too on his way to the door. As the door was closing they both popped their head in the door and said "shocking service!!!" as loud as they could. On the way back in the car they kept giving each other high fives and declaring, "Save the pizza, save the world". Needless to say once they got back to the room the pizza didn't last very long, they were starvo.